Happy Comic Release Day! Welcome to another installment of GeekMom Comic Book Corner, where we recap our adventures in comics for the week. This week we look at Hawkeye #8 and Guardians of the Galaxy Vol. 3 Issue #.01 and a book that’s a celebration of comics. I wanted to read Guardians of the Galaxy Vol. 3 Issue #.01 , written by Brian Michael Bendis and art by Steve McNiven, because quite frankly the cover intrigued me. The man in the background and the child holding the weapon both looked like they had an interesting story to tell. I know very little about the Guardians of the Galaxy team, so I was jumping in head first with no knowledge of their history. From a newbies stand point, I don’t feel like I needed to know any past history. The story was very well written and I understood everything that was going on. Both the artist and the writer did an amazing job of making me feel for Peter (the main character) and really want to help him. I wanted to cry with him when he suffered a tragic loss. I’m excited to see where this story takes me and hopefully learn more about his teammates and how they all got together to be the team they are. I’m slightly familiar with one of the team members, only because I think I saw him in Nova Vol. 5 Issue #1 (but I guess it could be another talking raccoon in cool clothes right?). Corrina adds: Can we ever have too many talking raccoons in cool clothes? This is another series I wish came out bi-weekly or even weekly digital, but alas, it’s a once a month treat. One that I’m looking forward to and have already subscribed through Marvel’s subscription service. After hearing so much praise since the title began, I finally took a chance on the first issue of Matt Fraction’s ongoing Hawkeye series. 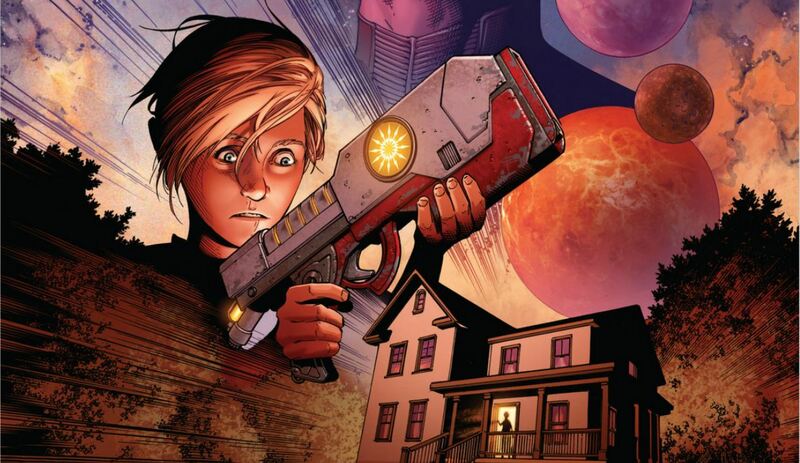 In just a few issues, writer Matt Fraction has turned Clint into a character that readers really care about. After reading the first story, I immediately downloaded the rest of the available issues, and devoured them. There are very few superhero costumes and no flashiness in the series. David Aja’s art is brilliant; his use of purple is a subtle touch in each issue. Hawkeye #8 picks up a thread from an earlier issue, bringing back a character to cause even more trouble in Clint’s life. This Valentine’s Day-themed story mixes in vintage romance comic covers by Annie Wu that are both fun to look at and play a small part in telling the story. 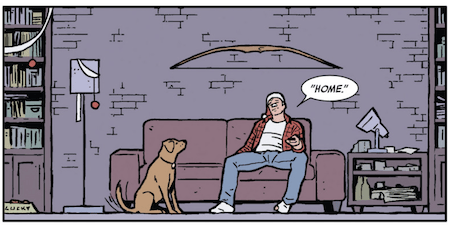 Hawkeye is a series that continues to impress and amuse me at the same time. If you haven’t picked up the first issue in the series yet, what are you waiting for? Go get it and read it now. I’ve been meaning to read this book since attending the Chicks Dig Comics panel last summer at C2E2 and after I was done, I kicked myself for waiting so long. Because I have never felt so loved after finished a book. 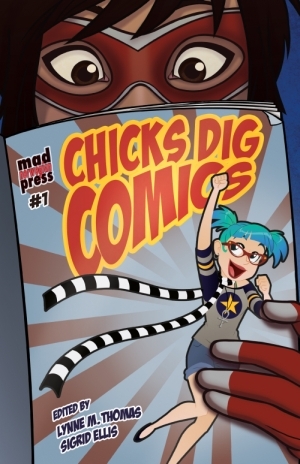 Chicks Dig Comics is filled with essays by women who love comics and not only want to state the obvious, that women love comics, they also want to share their passion with others. Some of these stories had me near tears, like Jill Thompson‘s story of how her father gave up a Sunday afternoon to indulge his daughter’s passion and take her to a comic convention even though he wasn’t a comic reader. Maybe it was because Thompson’s story could be mine, especially since we started reading X-Men about the same time. I saw my love of comics reflected in all the essays and when I was finished with the book, I felt much less alone in the world. Thanks to Lynne M. Thomas and Sigrid Ellis, who edited the collection, and thanks to everyone who wrote essays, gave interviews, and shared their stories.